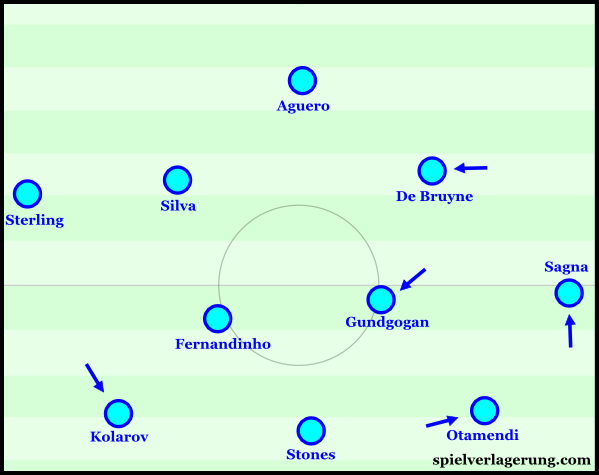 Being the first game where Silva, Gundogan and De Bruyne were all announced in the same starting team; all eyes were on how Pep would integrate them given that the system he had used thus far only had room for two 8s. From the start of the game this was done through an asymmetric 3-3-3-1 shape. In deep build-up they would create a back 3 with Kolarov dropping into the defensive line as a left centre back whilst Stones and Otamendi shifted across. Sagna the other nominal full-back had a far more “orthodox” role, as he moved higher onto the second line and was very much wing-oriented in his positioning. Given that one of Pep’s main positional rules is that the winger and full-back should not occupy the same vertical line; this had implications on the roles of Sterling and De Bruyne. With Kolarov playing deep and a bit more narrow Sterling remained on the left flank in a similar role to much of the season so far as they aimed to create the best conditions for him to take on full-backs. 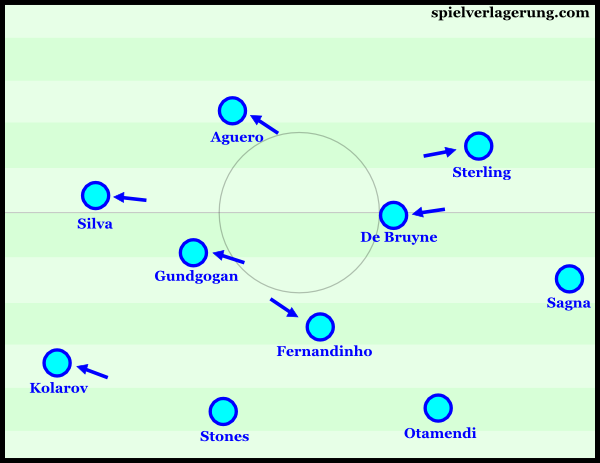 His positioning remained rather flexible as he reacted to the movements of his team mates, and there were some occasions where Kolarov or Silva moved out to the flanks and Sterling was free to move into the left half space. However on the right flank Sagna’s width-orientation meant De Bruyne was free to roam more centrally and add to City’s presence behind Swansea’s midfield line. From this position he often made late diagonal runs out towards the right flank in the final third to receive through balls and create crossing opportunities. This asymmetry allowed City to use De Bruyne and Sterling in roles that suited their skill set without compromising the wing staggering that is key to Guardiola’s approach. There are several reasons behind Guardiola’s use of staggering in wide areas far too many to list here but two important reasons are to avoid building in deep and wide areas and to create a stable passing dynamic. By removing his full-backs from the “usual” positions they may take up in build-up situations Pep implicitly forces his teams to access the midfield quicker. With no option for the centre backs to pass across to from the half spaces, the midfielders and forwards must move properly to create the necessary separation from their markers to facilitate progression or the build-up will have to restart. This removes the tendency for teams to use full-backs in deep positions from where teams often press more aggressively due to the instability of the location, and without very strong connections it becomes very difficult to retain the ball in these areas. When teams have wingers and full-backs on the same vertical line it often leads to vertical passes from the full-back to the winger which heavily decreases the potential for the winger to progress from there. Vertical passes are often met with high resistance and situational man-orientations as the defenders aim to prevent their opponents from turning towards goal. These types of passes often mean the winger receives the ball with a defender immediately behind them and are often forced to pass the ball back. However Guardiola aims to use diagonal passes towards his wingers that allow them to receive the ball with a forward facing field of vision to take on the full-back directly and this wing staggering is crucial to this. With these strong dynamics City were able to access dangerous spaces quite consistently at times this was done by pushing the opponents back and using the laser passing qualities of Stones, Kolarov and Otamendi. On other occasions this was done by bypassing Swansea’s press and using the transition-like characteristics to advance towards goal. However their final passing was uncharacteristically poor with poor decision making at times mixed with poor execution and this prevented them from taking advantage of these situations. 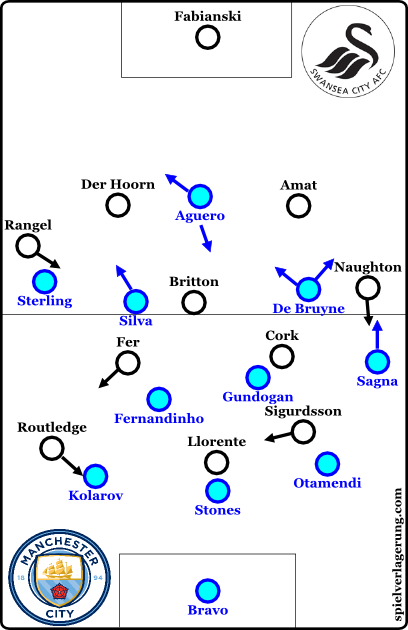 At times Man City had some issues with controlling Swansea’s build-up and this was partly due to Swansea using City’s defensive movements against them. With an overload in the first line against Aguero Swansea had a basis to circulate the ball across and with a situational use of their full-backs in deeper areas they maintained this overload even when City committed a midfielder forwards for access. Usually this is not particularly advantageous and can lead to a stale circulation game, however Swansea used it to their favour intelligently on a number of occasions. On a number of occasions this extended naturally into 3rd man combinations to beat City’s defensive line as a City centre back would often step forward to win the ball and stop the opponent turning towards goal. When Llorente managed to receive the ball and hold off his opponent he could set it back and Swansea could use this movement to their favour and play through the gap left to Routledge in a third man combination. Towards the end of the first half and for much of the second half Swansea were able to turn the contest into something of a transition game, and the end to end nature made the game quite chaotic. There were many reasons behind this one of them being some poor decision making from City in build-up which led to quite a lot of ball recoveries in midfield for Swansea. Another reason however was how Swansea were able to destabilise City’s build-up with the way they pressed Bravo. Bravo is quite clearly right footed and tends to avoid using his left foot. Therefore by pressing Bravo from his right side Swansea could force him into uncomfortable situations and eventually force more direct balls from the goalkeeper. In order to do this Swansea often maintained a high block but allowed the first pass out from Bravo to a centre back and would press Bravo on the return pass whilst covering the passing option to the right. This also limited the range of angles Bravo could access which gave the rest of the Swansea team a simpler orientation as they knew where the ball would be heading and could close City on their left side. With City now exerting less control over proceedings their chances were now predominantly through counter attacks after winning the ball in midfield. With the game at level scores City had to use these opportunities to go directly for goal as they sought to re-take the lead. However their execution of final passes or finishes was still lacking and this meant they continued to play in a transition based manner without real control of the game or of the scoreline. After half time Guardiola adapted the roles of his players and in turn the positional structure. Kolarov remained deeper on the left than Sagna on the right but he was now acting a bit higher and wider. Stones and Otamendi thus shifted over and occupied positions as centre backs would in a back four. Fernandinho was also acting deeper usually taking a position as a lone pivot but at times dropping into the defensive line. De Bruyne was now positioned more centrally as a nominal 8 and he had the licence to come deeper and support build-up or move beyond Swansea’s midfield line. Silva was now positioned on the left wing but had a far less linear role than Sterling and often added to City’s presence in midfield whilst Sterling took up a similar role to De Bruyne’s in the first half. Aguero’s role did not change much apart from a bigger focus on balancing Silva’s movement which often meant moving diagonally towards the left flank. This structural shift had little impact at the start of the second half as City were still forced into a transitional game but around the hour mark they began to exert more control again. This was potentially due to decreasing energy levels from their opponents as well as an increased focus on controlling the game rhythm with less frequent and direct attempts on goal being made. It was in this period that City regained their lead with a controversial penalty. As Swansea began chasing the game with increased desperation City were presented with more opportunities to extend their lead on the counter attack and they did so with Sterling securing yet another win for Guardiola’s side. Although City managed to make it a perfect 10 wins from their opening 10 games of the season there were some issues in this game that Pep will want to iron out. Particularly the instability that crept into their game and the poor execution in the final third. However this could be simply be the result of fatigue and at this moment City look imperious with their ability to win even on an off day being an important asset. Defeat in this game means opening day victory has been met with a 5 game winless streak for Swansea. However they were arguably City’s toughest opponents thus far and if Guidolin can continue to adapt their mechanisms for opponents as well as today they will surely be on their way up the table soon. I had a chuckle when I watched the game as a retro Barça analysis you posted recently showed them using a similar structure although Alves (Sagna) was considerably higher up the pitch. Do you think this will be Pep’s preferred structure when everyone is ready and fit? Perhaps, though given that KDB picked up an injury it looks like we’ll have to wait and see, but yeah it makes sense because I don’t see him using De Bruyne in a linear role on the right flank. Thank you all writers of this page. You guys help me to change the view of football games and make our football time more interesting because in my country, almost fans just focus on score board of the game and non-stoppable debate about individual performances. Could you suggest more good pages about football tactics and philosophy analysis for me to read and widen my knowledgge?